The county comptroller's office estimates the county will end the year with a $117.1 million operating deficit. A $10 million package of new fees and revenues getting a renewed push from Nassau County Executive Laura Curran would hike parking tickets by $50, let a county-hired law firm pursue dealerships and financial institutions to cover delinquent traffic fees incurred by vehicle leaseholders, and for the first time allow police officers to boot and tow vehicles with moving violations, such as speeding. Curran, a Democrat, first introduced the revenue proposals in March. But majority Republicans, who hold an 11-8 advantage on the county legislature and oppose fee hikes, tabled the proposals. GOP members objected to saddling taxpayers with new fees, although they didn't offer other deficit-reduction proposals. It is unclear whether Republicans will cooperate with Curran. Democrats also have expressed opposition to fee hikes, questioned hiring the law firm, and said they wanted more information on that proposal's impact on safety. The Nassau Interim Finance Authority last month identified $81 million in risks to the current year's $3 billion budget. In her midyear report and a subsequent letter to NIFA, the county's financial control board, Curran noted that the legislature had not approved her proposals. In the latest development, Curran asked NIFA Chairman Adam Barsky to “call for that legislative approval” in a July 31 letter, the same day that NIFA issued a report outlining the risks to the current year’s budget. The county comptroller’s office estimates the county will end the year with a $117.1 million operating deficit. However, the Curran administration has faulted NIFA's "pessimistic" outlook and projected a $9.2 million surplus for 2018. The administration's projection came with a caveat and noted the strain of tax refund settlements on the operating budget. Officials are hoping to borrow $300 million over the next year-and-a-half to pay down the bulk of the $360 million backlog. The administration is constantly scrambling for revenue to balance the budget. On Monday, Curran endorsed a return of the largely reviled speed camera program that was in operation for three months in 2014, but only if school districts want them near their buildings. 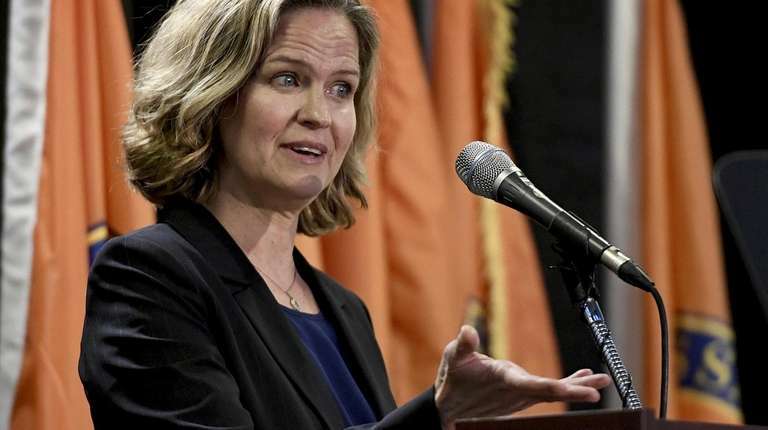 Curran said it was "premature" to say how much revenue the "opt-in" proposal — which requires state legislative approval — would generate for Nassau. Andrew Persich, county budget director, said in an interview, "Any expense we can save on, we always want to do that. That’s what my team does, we leave no stone unturned. We look for every opportunity for new revenue, or any way to save money, and every day something new comes up." Richard Nicolello (R-New Hyde Park), the legislature's presiding officer, said in a recent interview, “They submitted a plan to NIFA back in March, and very little has come to us, and the year is trickling away. So even if we approve some of what they want, the amount of money we recover in '18 would be really small. We’re not sure what they’re doing actually." A contract with Campanelli & Associates of Merrick, empowering the firm to pursue delinquent parking fees from the lessee and lienholders, such as car dealerships and financial institutions. Expected revenue: $8 million. Increase the administrative fee on parking tickets, boosting the total price from $100 to $150. In addition, enabling county police to boot and tow cars for moving violations. Currently, only parking ticket and photo enforcement violations are subject to boot and tow. Expected revenue from both proposals: $2 million. A program fee for a distracted driver education program for motorists ticketed for cellphone violations. Expected revenue: $180,000 from mandatory course fees. Under the plan to hire Campanelli & Associates, the law firm would work to collect delinquent fees from entities with a financial stake in the ticketed vehicles. The new effort would be “proactive” and focus on cars that are leased or financed, said David Rich, executive director of the Nassau County Traffic & Parking Violations Agency. The firm would attempt to collect payment by contacting the cars’ owners — such as the dealerships or banks — and provide them with a list of the scofflaws. The firm would contact the lessee and lienholders and attempt to collect money owed and a $360 administrative fee, said Rich.The firm is not authorized to boot and tow those vehicles and $100 of the fee amount would go to the Nassau County Police Department. Another bill would allow law enforcement officials to boot and/or tow vehicles with two or more parking, photo enforcement, and moving violations. Currently, cars cannot be towed for /having moving violations. The change in the law would enable the county “to take dangerous drivers with cars off the road,” according to the description of the bill provided by the administration. “While it might not stop them from driving another person’s car, it is an inconvenience to have your car booted,” county officials wrote in the memo. Police have issued more than 160,000 moving violations last year, according to the county. The amendment would make about 50,000 moving violations eligible for boot and tow. Both the contract and amendment were tabled at a May legislative committee meeting. Nicolello said he had concerns about the contract with the law firm, including its projected financial benefit to the county. “What authority does the county have to force the leasing company to pay for the ticket that the driver received?” Nicolello said. Minority Leader Kevan Abrahams (D-Freeport) said that some of his members, too, are not “enamored” with using a law firm to track down scofflaws. He said his caucus is waiting for more information about how the approach would improve safety. “We have some concerns because obviously, we never want to do anything that the public will perceive as some type of money grab and not directing it toward public safety,” Abrahams said.